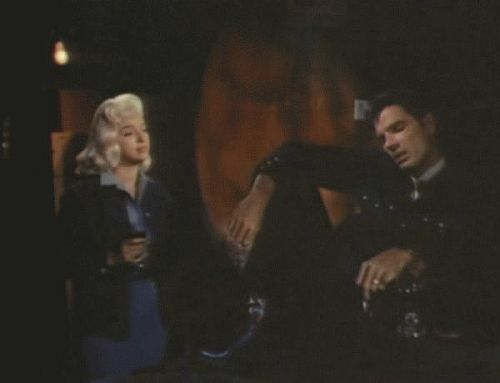 The Unholy Wife proves that Diana Dors could, in a pinch, act. It also proves she needed a strong director and a good story, both of which are sadly lacking in this film. 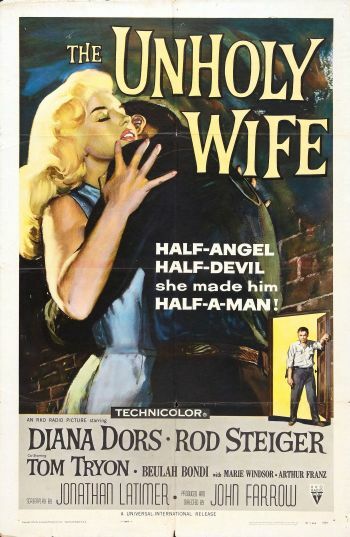 The poster tagline — “HALF-ANGEL, HALF-DEVIL, she made him HALF-A-MAN!” — is pretty much a lie. You see nothing of Phyllis (Dors) to indicate she’s an angel at all; one supposes they’re talking entirely about her physical appearance. However, what makes her a “devil” is nothing more than her rejection of a checklist of stereotypical female traits. She doesn’t really like kids, she won’t care for her elderly nutball mother-in-law Emma (Beulah Bondi), she doesn’t like being married to a man who apparently had his whatsit shot off in the war (Rod Steiger)… and it’s that issue with his whatsit that makes him “half a man”, not his wife Phyllis. Oh, and she murders someone. This was all kinds of confusing, but allow me to try to explain: The film opens with Phyllis (Diana Dors) just randomly shooting a gun to scare her mother in law. She pretends there was an intruder in what I assume was part of a cunning plan. Mom-in-law Emma (Bondi) calls the cops. They arrive coincidentally along with Phyllis’ brother-in-law, a priest (Arthur Franz). The cops are satisfied with Phyllis’ story, priest goes home, Emma goes back to bed, then Phyllis’ boyfriend on the side shows up (Ton Tryon). They kiss and argue and kiss and he sneaks out, but Phyllis’ young son (Gary Hunley) sees them. Now, the part that confuses me is that some time passes before Phyllis’ plan goes into action, and it’s somewhat unclear if she was wickedly cunning or if she just shot the wrong guy. A businessman wants to buy her husband Paul’s vineyard, but he won’t sell. Meanwhile, Paul’s neighbor and best friend Gino (Joe de Santis) wants to sell his vineyard to the developers, and Paul gets into a huge fight with him about it. But first, backstory! Paul (Steiger) and Gino were war buddies in the Big City for a conference or something when they met two slightly gold digging dames in a bar, Phyllis and Gwen (Marie Windsor). Paul hooked up with Phyllis, Gino with Gwen, and the couples eventually married. Gino and Gwen are a nice couple, while Paul and Phyllis — and yes, both couples’ names start with the same letter, which is the low-rent cousin to a wardrobe department that color-codes outfits of certain characters so you “subconsciously” know that they will eventually end up together. Paul and Phyllis got together, all right, but they don’t get along. He’s nice and sweet to her but she’s a dragon woman who doesn’t love his home and his family like she’s obligated to. Also, he likes her little son from a previous marriage/dalliance/something, which makes him a saint, but she just wants to be fabulous and has no time for kids. Back in the present day, Gino and Paul make up after the fistfight that started when Gino said he wanted to sell his land. Later that night, Gino heads to Paul’s house for a talk or a drink or something. When he comes in, Phyllis shoots him, and this is the confusing part: she may have thought he was Paul, but she may also have known it was Gino. It’s hard to tell because the script is a little, well, awful, and Dors’ face registers no expression. Paul takes the blame for the murder, saying it was an accident. Phyllis very helpfully gets confused on the stand to try to get Paul “accidentally” convicted. Meanwhile, she’s banging her boyfriend on the side in the wine cellar, which is underground and red and evil. So evil! Did I mention this was The Unholy Wife, and she’s meeting her lover underground in a room that looks just like Hell? It’s kind of a metaphor. Director John Farrow is about as subtle as a sledgehammer here. Paul loves children, his mother, apple pie and baseball, and his brother is a priest, and he sacrificed his manhood for America. It’s pretty terrible. Farrow directed Where Danger Lives and The Big Clock, so you know he knows what noir is supposed to be. He even directed one of my favorite Saint films, The Saint Strikes Back. 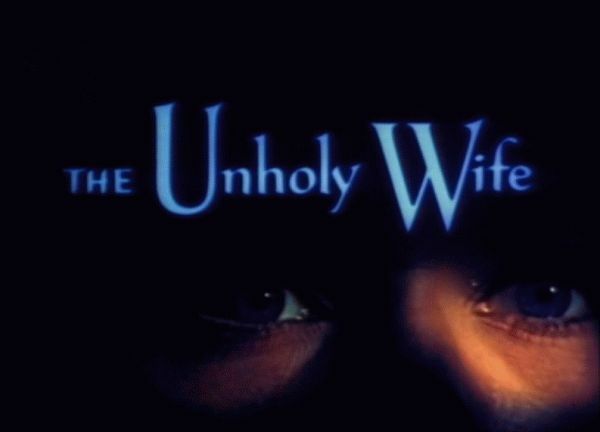 Unfortunately, Unholy Wife was just sloppy and poorly thought out and trite. The print TCM showed was rotten, too, impossibly dark with something very suspicious going on with the blues and the reds. Diana was pretty good for the most part, especially the courtroom scenes and the final scene with the mother-in-law in her sick bed. Solid character actors Marie Windsor and Joe de Santis were excellent. But Arthur Franz, the guy who played the priest? Don’t talk to me about Arthur Franz. And I’m a little miffed at Beulah, too, to be honest. P.S. I’m exaggerating about Paul’s pole. He confesses toward the end of the film that the Army doctors said he might not be able to have kids again, which I’m sure means injury, not complete loss of, the unit in question. I used to have a print of this film, and for the brief time that I had it, it was a popular selection amongst my audience, probably because it was Technicolor, but I’d like to think because it had something else to offer. John Farrow wasn’t a bad director, but he is certainly out of his element here. He’s not solely to blame, though. Much as I love Rod Steiger, I remember one review for this film (perhaps TV Guide) ending with the note, “Steiger is excruciating.” His performance in this film seems like a rehearsal for his portrayal of Mr. Joyboy in THE LOVED ONE, some years later. There is, admittedly, something lost in translation on the TV print— the SuperScope photography of the original and the color are probably the films best assets (unless you count Dors, but she hardly saves the day). This happened to be one of RKO’s very last productions, and when the company went into receivership, Universal released it theatrically. I have this movie! No I’ll have to watch it. The tragedy of Diana Dors is that she produced her best acting performances in movies that were never going to get her noticed by the critics. She’s terrific in Nothing but the Night, the only horror movie made by Christopher Lee’s own production company before it went belly-up, and a movie that does not deserve to languish in obscurity. She’s also superb in Joe Sarno’s Swedish Wildcats (AKA Every Afternoon). But Sarno was a sexploitation director so again her performance was ignored, even though it’s a sensitive and intelligent film (like all of Sarno’s films). You have this way,Stacia,of making a (by your own concession)thin-on-plot movie a must-see for me. I have to get a hold of this movie now..what have you done to me Woman?! !